MSA Altair 2X Gas Monitors incorporate proven XCell� sensor technology which enhances worker safety, compliance and trace ability. Like all Altair gas detectors the 2X minimizes the cost of ownership and has a proven track record of durability in Confined Spaces and the detection of toxic gases and vapors. 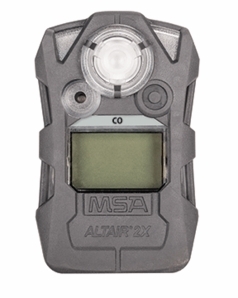 MSA 10154074 Altair 2X features a CO-H2 (Hydrogen Resistant)sensor with gray casing.